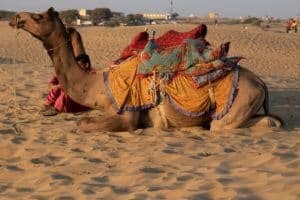 There is certainly a lot to see in Rajasthan. This state is large and the roads aren’t in the best condition, even if it is the most visited part of India. 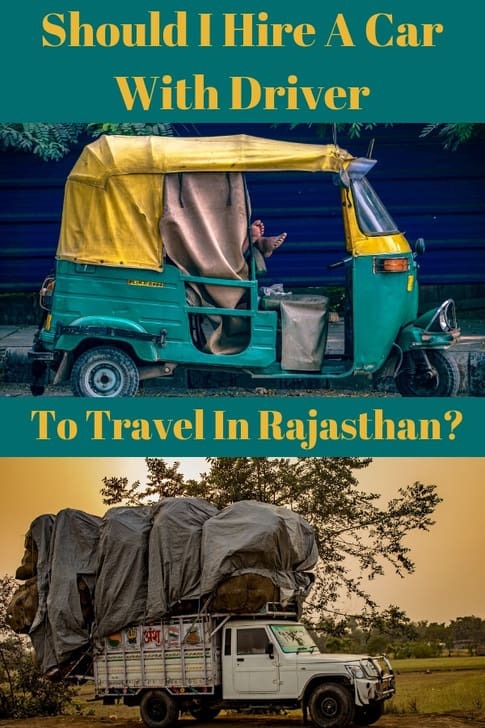 To travel around Rajasthan, you can use public transport. India has a very good rail service. You can choose between different classes and it is very cheap. Rail is a good solution if you have time, but you will need at least 3 weeks to visit Rajasthan by train. For us, this wasn’t possible because we had 2 weeks to travel around Rajasthan. 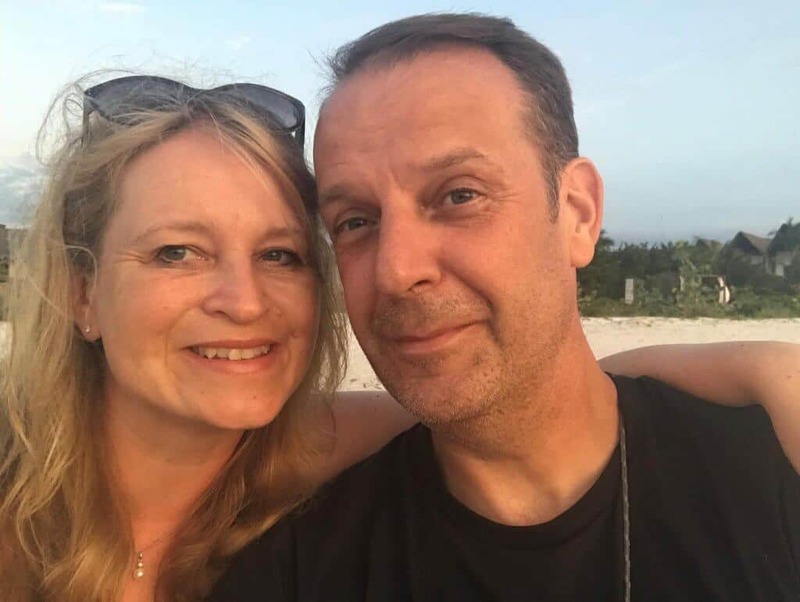 We didn’t want to be part of an organised tour, because we love to organise our own travel plans and have the freedom to do what we want. Consequently, the solution for us was to rent a car with driver. After some research, car hire in Delhi was the best solution for us. 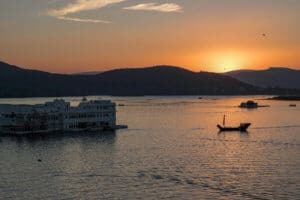 First of all, I created our itinerary (click here to know how to do a perfect itinerary) and sent it to the company from which we rented a private car and driver in Delhi. They came back to us with an improved itinerary and I updated it and sent it back. Once we had agreed our itinerary, we booked our hotels. We wanted to stay in authentic and cheap hotels. Most car hire companies can book hotels for you if you give them a budget. I wouldn’t really advise you to take advantage of this, because the driver gets commission (or he can eat and sleep at the hotel for free) when he brings you to certain hotels. 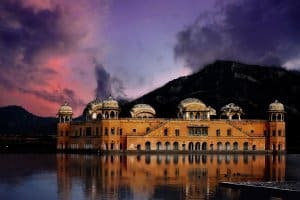 For us, the most important thing was to use our Rajasthan car rental to get out of touristy areas. As a result, we booked hotels we thought would be a good place to meet other like-minded backpackers. If you want to find a Hotel you can visit our resources page. At Off The Tourist Treadmill we love to take time to understand the culture of local people, make connections with them and try all kinds of food. We travel with an open mind and respect other people’s way of living. Sharing experiences with locals brings us new knowledge and seeing India by car and driver enabled us to achieve this. If you decide to choose a car service in Delhi, you must hire a driver. To drive in India requires a lot of skill. Indian driving is certainly unique! During your journey, you will face plenty of obstacles: animals sleeping in the middle of the road, traffic coming the wrong way towards you or roads suddenly disappearing in construction sites. For a quick view of life on Indian roads, check out this video. Why Hire A Car And Driver? To have a driver with you can be very helpful. 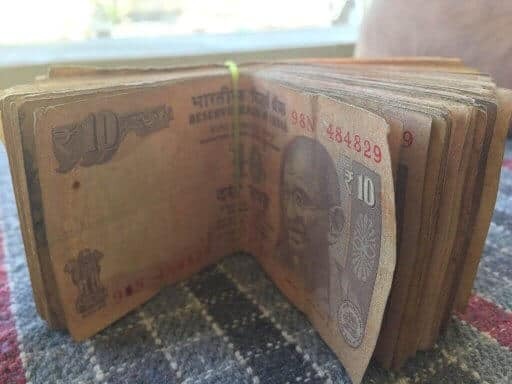 We went to India when the government removed all 500- and 100-Rupee notes and it was very difficult to find money. However, the driver knew people who could change money for us. Remember that the driver lives in this country and knows the area by heart. He knows the best way to go from point A to B and he may suggest a few stops on the way to discover more about the country. For example, we had the chance to visit a school and see how the children study. The downside of this is that a driver will also stop at tourist traps along the way. Although we told our driver that we didn’t want this, it’s part of his route. Drivers can’t drive for 6 hours without stopping, so they know places where they can have drink and food free of charge. However, these places are made for tourists and are not very authentic. We only bought snacks at these places and just used the stop for the toilet. 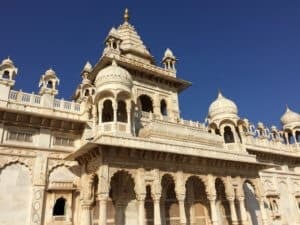 We really disliked this part of our Rajasthan car hire, but it was a very small part of our overall journey. 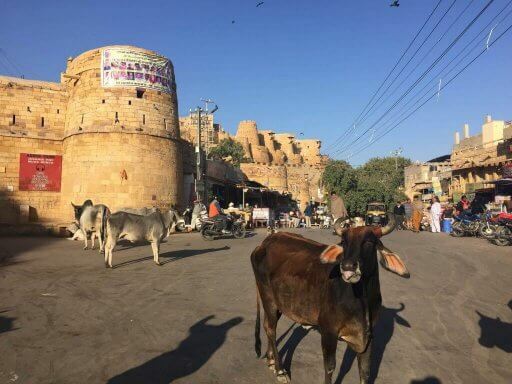 In Rajasthan there isn’t much to see between towns as the landscape is rugged. The biggest highlight was life on the roads. For us, it was a crazy experience driving in this country and you need to have a lot of skill to avoid accidents. Anything can happen; bulls sleeping in the middle of the motorway, trucks driving head on towards you on the wrong side of the motorway, roads vanishing and giving way to construction sites or flooded roads. The other great benefit of having a driver is that when you visit points of interest, he will drop you as close to the entrance as possible and wait for you at a nearby car park. For example, in Udaipur our driver dropped us right outside the Saheliyon-ki-bari gardens and the City Palace. Often, the tourist drivers have access to car parks close to the main entrance. If you are not comfortable buying tickets from the site entrance, he can also help you with this. Basically, the driver can offer you a lot of help if you need it. Just ask. This depends on the company and the car you use. You can have different types of car from a budget car rental like the small Suzuki Swift to a more expensive 4×4. For example, you can get a Suzuki Swift (3 places plus driver) for 2600 INR/day or Maruti Ertiga (5 places plus driver) for 3300 INR/day or Mahindra TUV 300 (5 places plus driver) for 3600 INR/day. You need to pay attention to what you get included within the price. Usually the price includes the car, the petrol, the tolls, the driver’s accommodation, the driver’s food and inter-state taxes and car park charges. You will need to pay for entrance fees, plus your hotels and food. Be aware that there is a minimum charge as well. This means that if you stay 2 days in the same place, you will still pay for 250 or 300 km. However, you can make the most of your driver by asking him to take you on a driving tour around the city. Personally, we chose to visit by ourselves on foot to get a more immersive experience. Even if you pay for car hire in Delhi with driver, you are completely free to do what you want at any point of your journey. For example, you can choose to take the train from point A to point B because you want to experience Indian trains. However, you need to be aware that you must pay the driver to come to point B and remember that the driver doesn’t drive during the night. I now know why! It is dangerous enough during the day time! Don’t forget that the driver will be with you from the morning until the end of the day. Make sure you clarify all of these details before departing. Have a clear picture of your expenditure before you sign with a car rental company. Golden Rule: Don’t pay the full amount at the beginning of your trip. Choose to pay for the first half at the airport and the second half in the middle of the tour. Where Does The Driver Sleep? I asked myself the same question. Does the driver stay inside the car to sleep? The answer is yes and no. Often, the driver gets free accommodation and food when they recommend a hotel. It is for this reason that they tell you that this hotel is better than another. In addition, the drivers get a few hundred Rupees from the car rental company for food and accommodation, but they try to not use it. Our driver was driving all day long, 7 days a week and knew exactly where he could rest. Over time, they build connections and do extra jobs on the road. I noticed our driver did some deliveries as well. Our driver picked us up at Delhi airport and dropped us at Delhi airport. He sees his wife and children between tours and for him that means 1 or 2 days every 15 days. The more drivers drive for a company, the more money they get. The better comments they get, the more they drive, so remember that they are offering you a service and will be happy to try and help you. This brings us to another question. How Do You Tip Your Driver? One of my friends is Indian and helped me with this. The drivers expect to have a tip. So, you have two solutions. You can tip the driver at the very end of your tour, but I don’t think this is the best way forward. To get a better experience, tip the driver at the end of each day when he leaves you at your hotel. The tip should be between 200 to 400 rupees a day. What I suggest is that you give him 300 rupees if you get a good experience and 200 rupees if you aren’t pleased with something. Tell the driver what you dislike and give him 200 rupees. See whether he improves the next day. If you are happy this time, you can give him 400 rupees and tell him today was great as it was exactly what you wanted to do. Drivers deal with different personalities all the time and everybody expects something different, so you need to be clear with your driver to help him understand what you want from your trip. At the end of the day, you will probably give the driver an average of 300 rupees per day but make sure he provides the service you want. How To Find The Best Driver Company? In India, km means nothing! You can do 500km in 6 hours or you can do 300km in 6 hours. Distances are calculated in time not km. So, it is very important to check your itinerary twice with the company. Make sure everything is included in the price. State border taxes can be expensive. We chose the smallest car and it was comfortable enough for us. If you want more space for your legs, you can upgrade for a better one because you will sometimes be inside the car for long days. Your starting point needs to be the same as the end point otherwise you will be charged for the return journey. The driver will make suggestions about visiting shops or eating at certain places. Remember that you are totally free to tell him no. The driver will try to bring you there because he will receive a commission. Hiring a driver and car was a very good experience for us and I hope I have helped you make up your mind. If you have any questions, leave a comment below and I will reply.